SemySMS is a free SMS mailing service. Create SMS mass advertising campaigns, inform people about promotions and discounts immediately after registration! Send and receive SMS messages through the WEB interface or API, using as much Androids phones as you wish. Perform SMS mailing from your phone, easy! 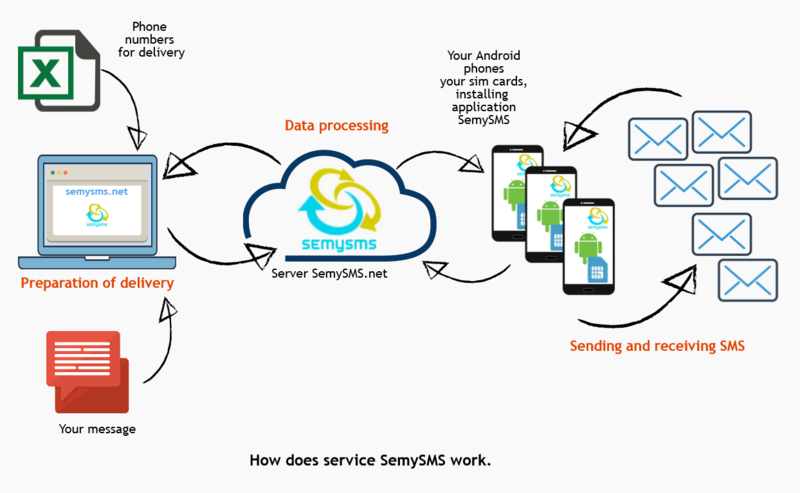 To start using our service, simply install SemySMS on your phone. Create your own SMS gateway! Variative template engine that allows you to create different text messages in the same mailing. Install SemySMS app on your Android phone(s). You can download it from a link on main page of the site, or from here. Create contact lists by uploading it from xls or exporting from application, by selecting the appropriate item from application menu. Send SMS to the selected group of contacts. In your mail will receive a message with further instructions.